The kids left the freezer open in the garage! I say kids, but I really mean, Cade! He was the last one that I know of that took something out of it. But of course, he doesn’t think it was him! Anyhow, the next morning when Casey walked through the garage on his way out the door, he noticed the door wasn’t completely shut. He wasn’t to happy, but we lucked out. All the meat is fine. It just frosted itself over terribly. So, the kids and I have been working at taking everything out, knocking the snowballs off all the packages and stacking them back neatly. Ugh! I am telling you all this for two reasons. 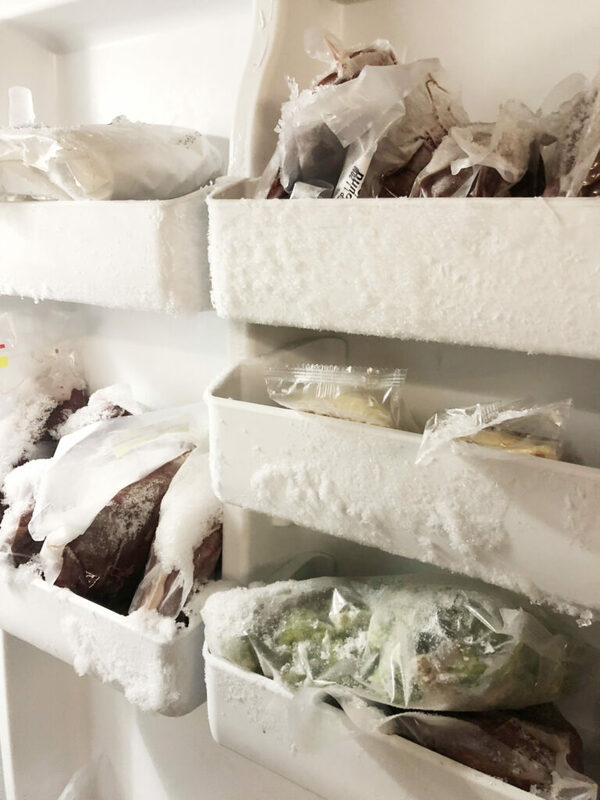 One, explain to your kids why it is important to make sure the fridge and freezer are completely closed. It could have been much worse for us, if Casey hadn’t of noticed. I would have freaked out if we lost the meat that we have in there! Secondly, while digging around knocking snow balls off, I found a couple packages of pork steaks from a pig Cade shot last year! Score!! I thought we had eaten all of that pork! 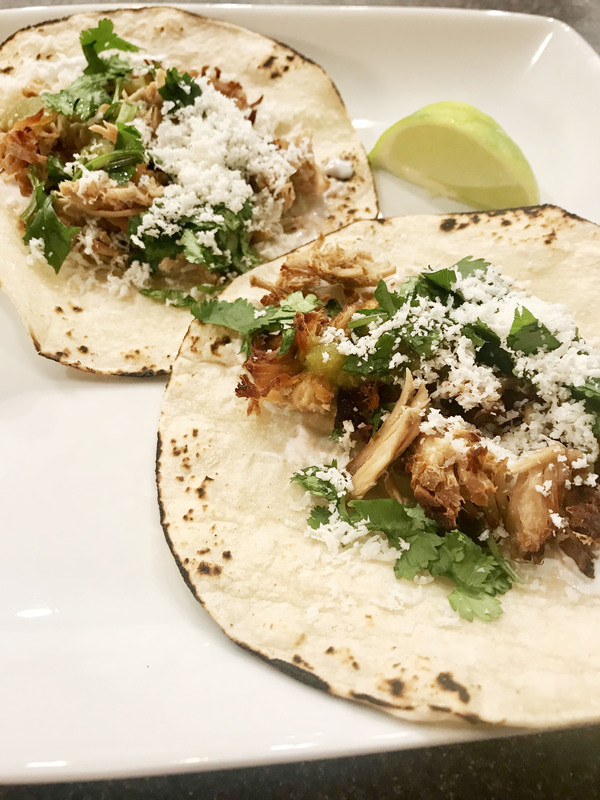 My bestie Jami, told me she made carnitas last week, so it has been heavy on my mind and as soon as I saw those pork steaks there was no question they would become carnitas! We ate them tonight and everyone pigged out! Haha! But seriously, they were a hit and I thought I better blog the recipe asap, so I remember exactly what I did to make them so bomb! Obviously, this recipe can be made with store bought pork as well. We just prefer to shop in nature, as you all know. I give credit for this recipe to Jami. She told me the basics over a week ago and I just sort of threw the stuff together with my own twist! I am sure a pork shoulder would be even better to use than the steaks I had, but they tasted great regardless. Super easy to throw in the Instapot before you drop kids at school and when you make it home from work only have a few things to do, to get them on the table! The recipe is fairly basic. Thaw your pork and then cut into 2-3″ pieces. I used about 3lbs. of pork to feed our family of 4 with a little left over for lunch the next day. Throw the diced pork into the Instapot. Sprinkle with 1 tablespoon each of cumin, chili powder and paprika, and a 1/2 tsp. each of salt and pepper. Then squeeze the juice of two limes and two lemons over the top and pour 1/2 of a beer (I used Coors Light, but I wish I had a Blue Moon or Shocktop to use) and 1 cup of Orange Juice into the pot as well. I used Limeade instead of the OJ. It’s what I had. And that is it! Slap on your lid and make sure your little venting dial is turned right. Hit the slow cook button and set the hours. 8 Hours seemed perfect, but I am sure you could buy a little more time here, if you need it! After the eight hours, pull the pork from the juices and put into a mixing bowl to shred. You can shred with a fork or use your mixer to quickly shred the meat. Line a sheet pan with aluminum foil and lay the shredded meat across the sheet. Melt a half a stick of butter in a bowl in the microwave and then drizzle the melted butter over the top of the meat on the baking sheet. Then place it under the broiler on high for 10 minutes to brown and crisp. 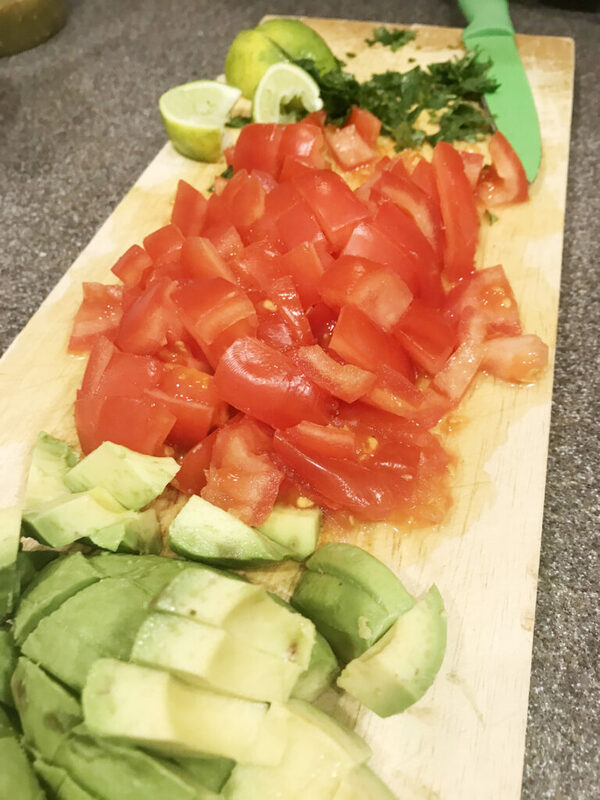 While its crisping under the broiler, dice up your cilantro, slice some limes, grate the cheese, and warm the tortillas. In the time it takes you to do that, they will be ready to pull from the over and serve! The wild pig does add just a tad more flavor to this dish, but it is leaner than a store bought pig and that is why I drizzled some butter over the top. Might not need to do that when using a store bought cut, but Im not sure and a little butter never hurt anything. The Instapot is a cool tool. Of course, you can always slow cook in a roasting pan inside your over and you can always use a traditional crock pot slow cooker as well. Let me know if you end up making some in your Instapot and if you have any other must try Instapot Recipes, please comment them below. I’d love any tips you all may have! Place diced pork into Instapot and season with paprika, chili powder, cumin, salt and pepper. Drizzle the juice of the limes and lemons over the meat. Pour in beer and orange juice. Cover and set Instapot to slow cook for 8 hours. When done cooking. Set oven to broil on high. Remove pork from the Instapot and place in mixing bowl. Hand shred the pork or use mixer to shred. 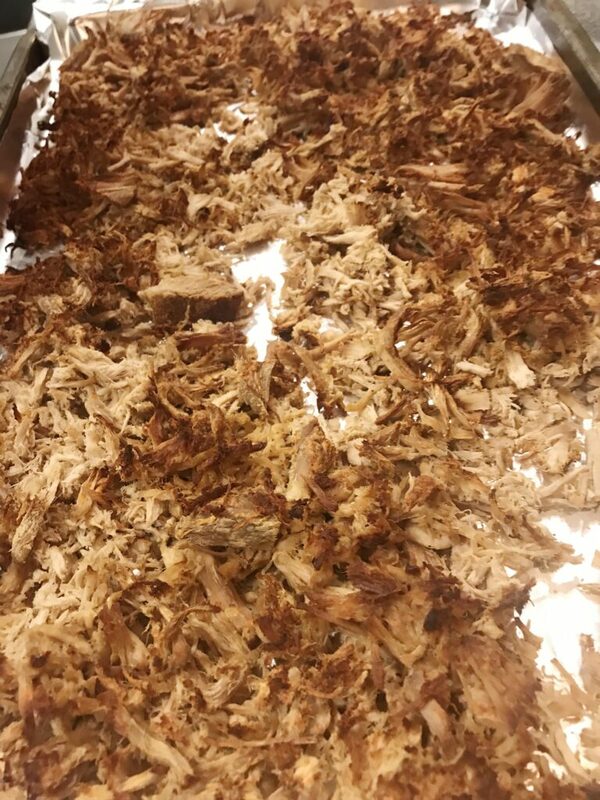 Place shredded pork onto the lined baking sheet and spread out evenly. Place baking sheet in oven for 10 minutes. Warm tortillas, dice cilantro leaves and onion.